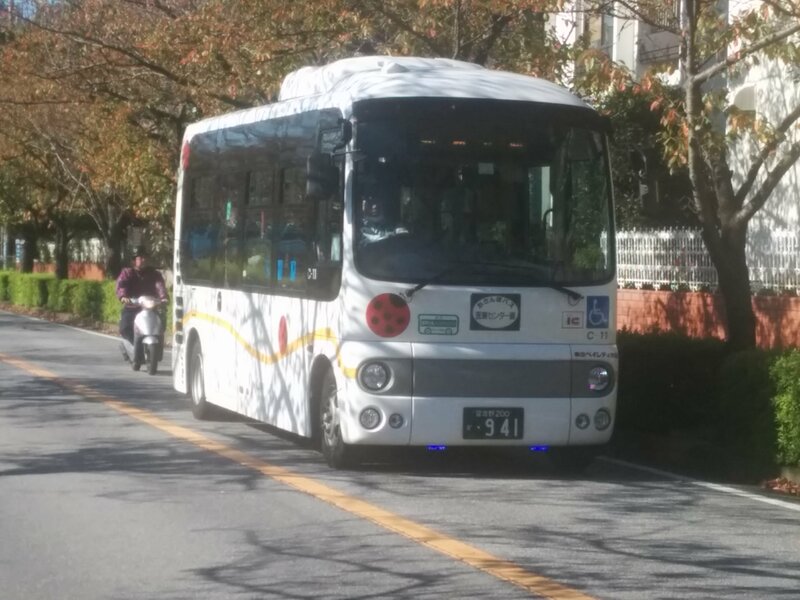 Do you know how “the community bus system” works in Japan? This is a picture of Shin Urayasu station and it’s bus terminal. This week, I stay in Shin-Urayasu near Tokyo Disneyland as I have a business trip to Japan. It is nice to stay here because the weather is always good. So I walked outside and found small buses are going into the town. It is called “community bus”. Please compare a white bus in the left and a red bus in the right on the picture above. A left white bus is smaller than a red one. Let me explain how this community bus works as the important part of the city transportation system. 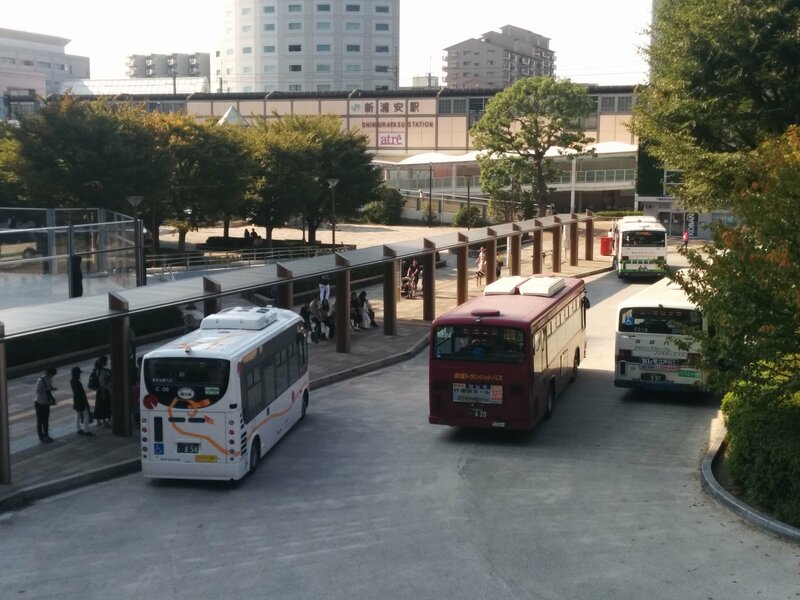 In Japan, most stations in cities have bus terminals in them. Just like the pictures above, many people can go to the stations from their home by using buses. Some of them live in places where they cannot walk to stations as it takes too much time. Therefore, buses are needed for people in cities to reach stations. The problem is that buses are usually too big to drive through small roads in cities. Buses usually run through main streets and people should go to bus-stops along main streets. It takes time to go from home to bus-stops along main streets. Unlike other countries in Asia, Japan is an aging society. So many senior people live here. It is very difficult for seniors to walk from home to bus stops along main streets. This is why “community bus” are introduced. This picture shows us “community bus”. Please compare a motorcycle to the bus. You can find this bus is not so big. Therefore the bus can drive along small roads in residential areas. Bus stops can be located near homes. It is good for senior people as they can go to stations, shopping malls and hospitals by “community bus” more easily. 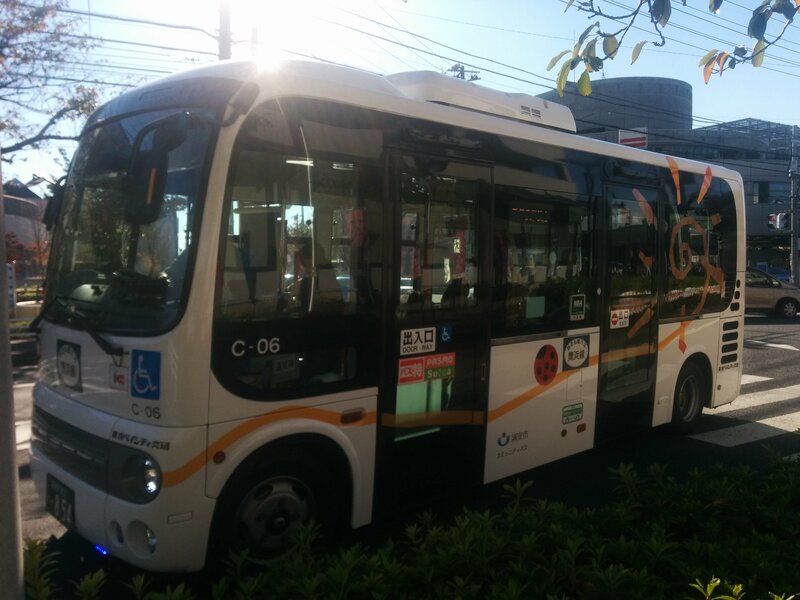 It runs every 20 minutes in Urayasu city. When you look at the picture above, you can notice that door steps are located lower than usual. Therefore It is easier for older people to get on and off “community bus” than big buses. Of course, it is more energy-efficient to bring a smaller number of people to destinations as it is lighter than a big bus. Now many Asian cities including Kuala Lumpur have developed railway systems in cities to reduce traffic jams. We also should consider, however, how we can go to and come back from the stations. Otherwise, railway systems cannot be used as main transportation systems because most people may continue to use cars. In the future, with GPS system, we might be noticed that how we can use buses to go to destinations in a real-time basis through mobile devices. It must be more convenient as we do not need to wait buses at bus-stops for a long time!